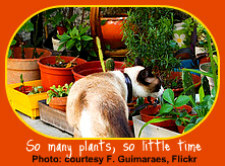 The Indoor Gardener who shares his/her home with a cat needs to know the cat safe houseplants. I've compiled an abbreviated list including some of the most common choices of plants that are safe to grow in a house shared by a cat. If you find an exotic plant that you'd like to grow indoors and you're not sure about its safety, call your veterinarian, a University known for its botany department, or your closest poison control centers. 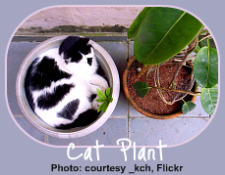 This is by no means a complete list of cat safe houseplants. I've picked some of the most likely plants to be grown indoors; a more complete but still not exhaustive list of plants is available at the ASPCA website. Never bring a Sago Palm (Cycad) or most members of the Lily family, such as the Easter Lily, into a home shared by an Indoor Gardener and a cat. These are highly toxic to cats and can cause death within days. Click here to read more about plants poisonous to cats. About 75% of cats are genetically drawn to catnip. A member of the mint family, it's easy to grow, even indoors. Your cat, however, might devour it quickly, so plan on starting a new batch every few weeks. Catnip is fun for your feline, but not addictive. You can also plant cat grass, a healthy alternative to chewing on your other houseplants. At times your cat might eat this in order to get rid of hairballs, so if she/he vomits, don't panic. If you see other symptoms of ingestion of plants poisonous to cats, though, call your vet immediately. and see our suggested products. As a pet owner, you might also like to read about plants poisonous to dogs.